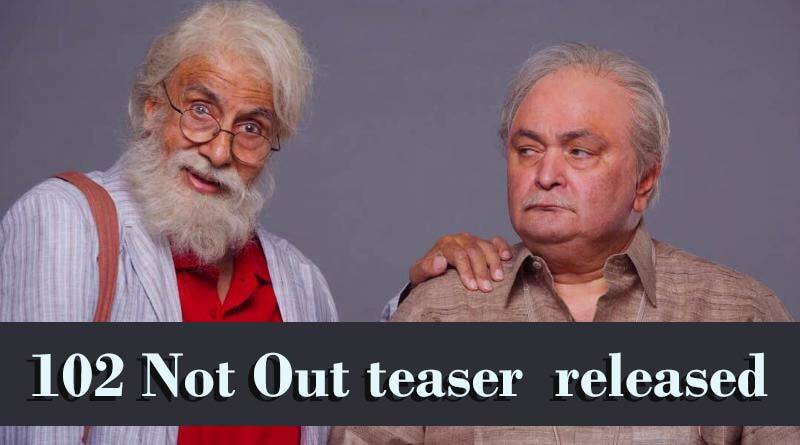 After 27years two legendary actor Amitabh and Rishi Kapoor have again collaborated for a film 102 Not Out, is an upcoming Indian Hindi comedy-drama film starring these two in the lead roles. This film is based on a running Gujarati play written by Saumya Joshi by the same name and is being directed by Umesh Shukla, who has earlier directed Akshay Kumar starrier OMG, (Oh My God). The first official trailer of the film was released last week. In the trailer, we can see the unique bond between father and son. Where Amitabh Bachchan is a 102-year-old father while Rishi Kapoor is a 75-year-old son. The amazing teaser of the movie showcases the love between these two, where the father is full of life and young at heart as compared to his son. Amitabh performs the role of the father who is full of life and enjoying his life which we can see in the trailer by playing football and all. While his son prefers to act according to his age. The Initial release date of the movie is 4 May 2018. This is the first in the film industry, we will watch the most unusual love story of the father and son“Apne bete ko vridh ashram bhejne waala main pehla baap banuga,” This line is already creating publicity. Amitabh and Rishi have earlier worked together in several films, including Coolie, Kabhi Kabhi, Amar Akbar Anthony and Ajooba.